For over 2 decades, my family and I have been involved with local and worldwide charities. We decided we would like to dedicate more time to these worthwhile causes and for the first time, invite others to get involved. Our charity work used to focus on canine organizations such as the SPCA and Respect-a-bull. As of late, our interest has been more on “people” charities. The focus may be be shifting back to dogs in the future. We will keep you posted! A concern to me and anyone who has ever donated to a charity is accountability. How will the money be spent? Will it actually make its way to those in need? The four charities listed below are organizations with long-standing track records or are run by individuals I have known personally for many years. I met John and Judy Pex from Elat, Israel in 1982. John and Judy have been involved in numerous charitable causes since that time. One of the key projects that my family and I have been contributing to in Israel is in helping Sudanese refugees find jobs and housing. Most of these refugees traveled on foot from Sudan to Israel and risked their lives on the journey. Even as they crossed the border from Egypt to Israel, many were being shot at by the Egyptian border patrol. My goal over the next year is to raise enough funds for an entire Sudanese family to be relocated to Canada to start a new life. 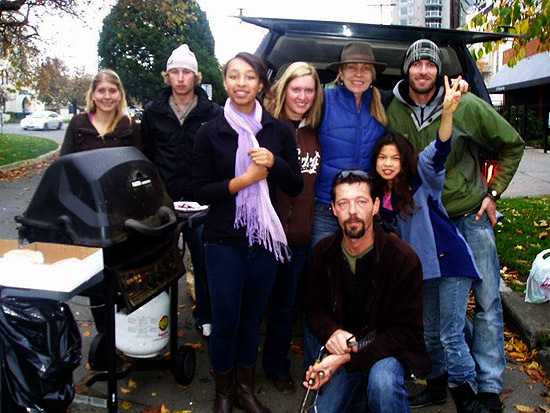 Our Place has been established since 1986 and is one of the foremost charitable organizations in Victoria providing help to the marginalized, and the homeless. It runs solely on the support and funding of the citizens of Victoria. My goal for this charity is to continue to provide financial support and time whenever possible. I would also like to encourage others to get involved even if it means a few hours of volunteer time. If you would like to join my family the next time we volunteer, email us and we’ll be sure to let you know when we are attending next. To make a financial contribution, click here. 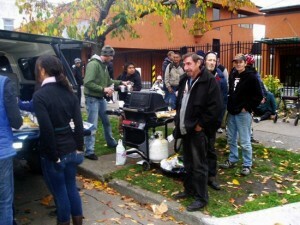 Wonderdogs team feeding the homeless outside the open door shelter. November 2010. World Vision is an example of a charity that has a long-standing track record and will divulge exactly where the funds are going. The key area of our support over the years has been sponsoring orphans in war torn Africa. Your support will provide direct funding for food, clothing, housing and schooling for these orphans. My long term goal for this charity is to provide regular fundraisers that raise awareness and financial support for this most worthwhile cause. For more information click here.